0.01MB. Updated 2018-09-29. Only supports Anki 2.1.x. Awesome way to individually see which tags have been seen and matured! Very cool but experiencing crashing issue. Everytime I open and close Syllabus Anki crashes. what is the usage of the 'export'? ,I had thought it can include the cards. Export in the addon only outputs the data from the syllabus window. This is so that people can use their data/use for visualizations etc. 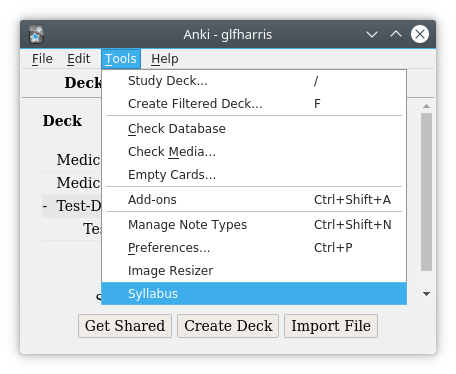 I believe there is a way to export card content baked into vanilla anki if you go to Main Window > File > Export, then choose the format you want. This addon isn't compatible with Anki 2.0, which you are likely using. Good idea, but Does'nt work. Download failed : Error 404. A solution ? This is great. It's nice to see all the stats in one place, and it helps me decide the ideal interval for my decks. Could not even download the add one. "Download failed: Error downloading 404"
This is likely an issue with your internet connection or ankiwebs servers. If you're still interested in trying again another time should probably work. Very helpful, and works really well. You can see all your stats in one page. This should be a default thing in Anki.